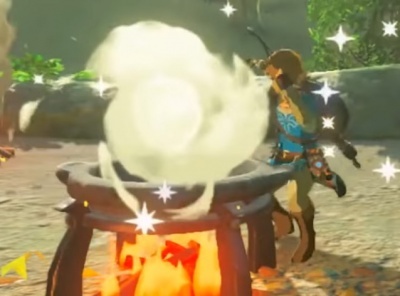 Link cooking in LoZ: BotW. This page will have all the recipes in the game The Legend of Zelda: Breath of the Wild. If you find a new recipe, please add it to the recipe list below! But please take care to check that it is not a generic extension of an existing recipe, as described below. Also, as there are sometimes random bonuses applied to a cooking session, please ensure to record the normal (unboosted) result; you may have to repeat the recipe (you can tell by the jingle played). Check back often for new recipes that have been discovered! Most cooking requires the use of a Cooking Pot over a lit campfire. Some ingredients can be roasted by dropping them on a fire, hitting them with a fire arrow or Red Chuchu Jelly blast, and dropping them on very hot ground or in hot water. Roasted foods stack in your inventory and heal 1.5x the hearts of the raw value. Some ingredients can be frozen by dropping them in icy water or on snow, or hitting them with an ice arrow or a White Chuchu Jelly blast. Frozen foods stack in your inventory and heal the same hearts as raw, and provide a heat resistance buff for 1 minute. Frozen foods will eventually thaw while in a normal-temperature zone. In order to cook, you need to hold between 1 and 5 ingredients. This can be accomplished from the inventory "hold" option. Then, drop the held items into the cooking pot. You can hold 60 recipes in your inventory at a time. Most food ingredients can be cooked singly or together. The base hearts of each item are added together and then multiplied by 2 in the final recipe. For example, Apples heal 1/2 heart, while Simmered Fruit heals 1 heart per Apple included. Fairies can be cooked into Fairy Tonic, which heals 7 hearts and sells for 2 rupees. Every additional Fairy, or any Fairy added to another recipe, adds 10 hearts. Acorns and Chickaloo Tree Nuts are unique seasonings. The first of each, added to any other ingredient, contributes a full heart, and every nut thereafter contributes 1/2 heart. The resale value of a recipe can be determined by adding their combined value, multiplying by 1.5 / 1.8 / 2.1 / 2.4 / 2.8 (depending on number of ingredients), dropping the decimal, and then rounding up to the nearest 10. For example, 1x Raw Prime Meat = 15 * 1.5 = 22.5 -> 22 -> 30, 2x Raw Prime Meat = 30 * 1.8 = 54 -> 60. The exception is cooking a single Acorn, which will sell for 8 rupees. The most expensive known recipe calls for 5x Raw Gourmet Meat or Raw Whole Bird, which will sell for 490 rupees. Many food ingredients have special effects, such as stamina restoration or cold resistance. Adding ingredients with the same effect can improve its potency and duration. All ingredients and spices improve duration. If you try to combine two or more effects, the recipe will have none. If all ingredients had 0 base hearts, it will heal 1/4 heart. Elixirs are cooked with at least one critter and at least one monster part. 1-4 critters can be added to improve the potency and duration, while monster parts only improve duration. Besides the name and this requirement, elixirs receive the same additive bonuses as other recipes. For example, same-effect food ingredients can stack with the critter and improve its potency. Also, elixirs benefit from extra hearts and duration from adding food ingredients and spices. Cooking a critter or a monster part without the other. Cooking two different effects into an elixir. Cooking an invalid combination of seasonings. Cooking with wood or an ore results in Rock-Hard Food, which heals 1/4 heart and sells for 2 rupees. Occasionally, cooking results will be randomly improved, and a special jingle will play. Possible bonuses include +3 hearts, +1 potency, or +5:00 duration. If a bonus would not apply, another is chosen. If you see a result that is better than it ought to be, it is likely because of this. Cooking between 11:30 PM and 12:15 AM on a Blood Moon will guarantee a bonus. Cooking with either a dragon part or a star fragment will also guarantee a bonus. Only one status effect from food can be active at a time. Hearty, Energizing, and Enduring recipes are special and do not generate a status effect. Extra hearts and stamina wheels are not added to any that already exist, but will replace any that are missing. Status from food stacks with your armor until it reaches the combined cap. For example, two Barbarian armor pieces and a Mighty recipe with potency of 2 will cap out at 3. Some information may be incorrect or missing. Please add in correct values. These ingredients can be added to any elixir, but do not count as either "critters" or "monster parts" for recipe purposes. Meat Skewer Any Raw Meat Restores twice the number of hearts as the raw meat used. Spicy Pepper Low 3:30 This is the recipe from the Old Man's Diary. This recipe does involve a critical success (invoked by the dragon piece), which automatically goes towards boosting the effect strength. Using fewer fairies can cause this effect to shift to boosting health. Using a lesser dragon part can cause it to shift to boosting duration. Restores four hearts and provides a low-level speed boost for 1:00 minute. Restores seven hearts and provides a high-level speed boost for 30:00 minutes. These ingredients can be combined in almost any fashion and their hearts will be added together. For example: 3 Hearty Bass and 2 Hearty Truffles will create one dish with 8 additional hearts. All dishes, when cooked, restore full health, and since there is no time limit, the addition of ingredients like salt, spices, and raw meat, which all contribute to life restoration and/or duration, have no effect on maximum heart dishes, except to increase their resale value. If dishes are being cooked simply for hearts, do not waste the meat/spices. In addition, cooking hearty dishes during a blood moon increases the total heart value of the dish by 1 (at least, needs verification! ), making the maximum hearty dish a Hearty Fried Wild Greens with 26 additional hearts (25 hearts from 5x Big Hearty Radishes + 1 "blood moon" heart) (again, needs verification). The following table shows some example dishes which are possible, but it is worth noting that ingredients like eggs, wheat, raw meat, salt, and butter are all being wasted in these recipes, and are better used in cooking other dishes. Hearty dishes are reliably the most useful, and are a waste to sell. Always choose to sell non-hearty dishes. Unlike temporary maximum stamina, which only gets used once your regular (green) stamina wheel is empty, temporary maximum hearts get used first. Another important point is that the total number of hearts you can have (regular plus temporary) appears to max out at 30 (two rows of 15). So if you already have ten regular hearts from trading in spirit orbs, its a waste to cook a recipe that will add 25 hearts (i.e. 5 Big Hearty Radishes) when it will give you no more of a bonus than a recipe that adds 20 maximum hearts (e.g. 4 Big Hearty Radishes). This is even more true later in the game, where (depending on how you spend your spirit orbs), your heart total can get even higher. Elixirs are cooked using at least one critter and at least one monster part. Food ingredients can also be added for additional hearts. Elixirs are the best way to make money in the early game, simply because you can get everything you need on the Great Plateau before you set out on your journey. One Elixir made from one Sunset Firefly and four Bokoblin Guts sells for 230 Rupees, but replace the Bokoblin Guts with Lynel Guts and the Elixir sells for an amazing 2,250 Rupees! This quickly adds up when selling multiple elixirs. All those monster parts are just sitting in your inventory anyway, so you might as well cook them into elixirs to sell for a nice profit! When cooking Elixirs for selling, if you use one out of the five slots for any insect or lizard, it makes little difference in sell value, but Elixirs with more monster parts increase the sell value, so use the four remaining slots for monster parts. All the sell value comes from monster parts, so don't waste your time with fangs or teeth. The best parts to use are the Guts, Lizalfos Tails and all Lynel parts because they have the highest individual sell value. Because of this, when they are added into an Elixir, the Elixir sells at a much higher price. Typically, adding 1-2 critters produces a weak effect, 3 critters for a moderate effect, and 4 for a strong effect. This varies depending on the critter. Adding same-effect food ingredients can stack with the critter's effect to improve the elixir's potency & effect. Adding food ingredients with the same effect can also boost critters boosts the potency and duration, while adding monster parts boosts duration. This page was last modified on 8 April 2019, at 10:23. Content is available under Creative Commons Attribution Non-Commercial Share Alike unless otherwise noted.